Snapchat vs. Instagram Stories: Which Channel is Right for Your Brand? 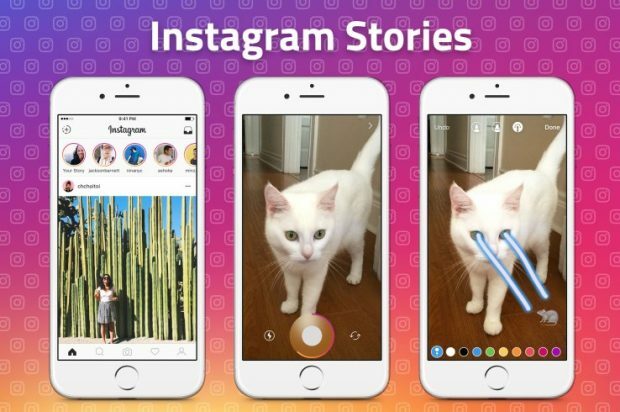 In the summer of 2016, you likely opened Instagram to quite a surprise: Stories that look suspiciously like the one you’d see on Snapchat. Videos on infinite loops, photos with text captions directly on the image, and stickers galore. So, what’s the deal? Both Snapchat and Instagram Stories revolve around disappearing content—that is, videos, photos, or short-form content that fade after a given period of time. The episodic-type posts give followers a serious sense of FOMO and encourages them to regularly check back for fresh content. But when it comes to Snapchat vs. Instagram Stories, which is best for your business? As a busy social media pro, time and resources are limited, and it may be unrealistic for you to juggle both. In this post we’ll highlight the similarities and differences of the two platforms so that you can hone in on the channel that makes most sense for your business. Depending on your target audience, either or both could be a solid fit for your brand. So, let’s take a moment to break down the important stats for both channels so you know what’s what. The numbers don’t lie: Instagram and Snapchat are two of the most popular social media channels currently in the space. Snapchat, for example, boasts 100 million active daily users—and more than half of them (54 percent) log into the app daily. That’s one dedicated audience. And Snapchatters are also highly engaged, sending more than 400 million Snaps daily, or 8,796 photos per second. When it comes to Snapchat for your brand, you can expect a sponsored lens (more on those later) to reach up to 16 million users, whereas around 40 to 60 percent of daily Snapchatters will see a sponsored geofilter. Instagram, on the other hand, boasts five times the number of Snapchat’s users: 500 million, with 200 million daily active users on Stories alone. And these users share an average of 95 million posts daily. Like Snapchat, Instagram users are plugged in. In fact, Psychology Today touts Instagram as the “Happiest Place in the (Internet) World,” with users liking 4.2 billion posts daily. Many brands are already aware of these stats, and have jumped aboard the Instagram bandwagon. Almost half (48.8 percent) of companies used the platform in 2016, and that number is expected to almost double in 2017. Despite sharing some serious similarities when it comes to features, the user groups on the platforms are surprisingly different. While Snapchat is the new(er) kid on the block, it’s the platform of choice for millennials. According to research, Snapchat is the most popular platform for people aged 12 to 24 years old. While Instagram’s user base isn’t quite as young, this platform has an international audience on lock. The platform released data in 2016 that shows 80 percent of its users live outside of the U.S., and that means big potential for brands targeting a global audience. In the U.S. specifically, almost a third (31 percent) of American women and 24 percent of American men use Instagram. For more in-depth data to dig through when doing homework on these platforms, read through our breakdowns of relevant statistics for Instagram and Snapchat. Now let’s drill down a little further into the demographics. That way, marketers can get a granular view into the different audiences, and make decisions accordingly. As mentioned, the majority of Snapchat users are millennials, but that’s starting to shift. 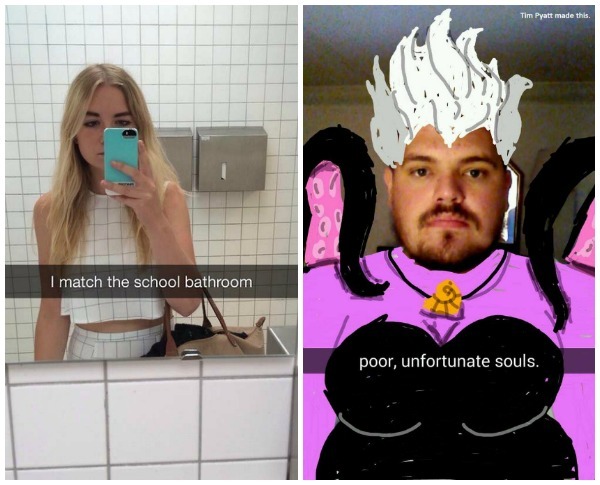 More than half of new Snapchatters are over the age of 25. And according to Snapchat’s own figures, on any given day, 41 percent of 18- to 34-year-olds use the app. A recent Harvard survey of 2,000 social media users in the U.S. also showed that far more women use Snapchat than men, with 42 percent of the female 18- to 29-year-olds surveyed saying they had a Snapchat account, compared to just 31 percent of the men. But just where in the world are these users? Based on recent Global Web Index data, the highest percentage of Snapchat users (compared to overall population) is Ireland, with a penetration rate of 20 percent for Internet users 16 to 64. Following our friends across the pond are Saudi Arabia, Sweden, India, and finally the U.S.—with a penetration rate of about 10 percent. More than half of college students (53 percent) surveyed had a Snapchat account. That number was a bit lower for their 18- to 24-year-old counterparts who weren’t enrolled in school, with 46 percent having accounts. Snapchatters are divided fairly even politically: 39 percent identify as Democrats, 37 percent as Republicans, and 35 percent as independent voters. Snapchat users are diverse—40 percent identified as white, 25 percent identified as black, and 34 percent identified as Hispanic. For more useful information about the app’s users, check out our Snapchat demographics post. For young people, Instagram is second only to Snapchat. Pew Research shows us that 55 percent of 18- to 29-year-olds are on Instagram, with the next largest demographic being 30- to 49-year-olds at 28 percent adoption. If you scroll regularly through your own Instagram feed, it’s probably no surprise that most Instagrammers live in cities (32 percent) or suburban areas (28 percent). And, as we mentioned, around 300 million of the 500 million active Instagram users live outside of the U.S.
For more useful information about the platform’s users, check out our Instagram demographics post. Now that you’ve got a better handle on who exactly is using Snapchat and Instagram (and where they’re using it from), let’s discuss the differences in each platform’s features. Snapchat only offers one avenue to create posts—a “story” that’s a combo of all your video or pics snapped in the last 24 hours. After a Snap is a day old, it disappears from view (unless a user reshares it from their Memories). By tapping the camera button on the bottom of the screen, you can take a photo (like a quick selfie) or video up to 10 seconds in length. From there, you can add text, stickers, drawings, filters, and other features to jazz up your content, then send directly to a follower or post to your Story. 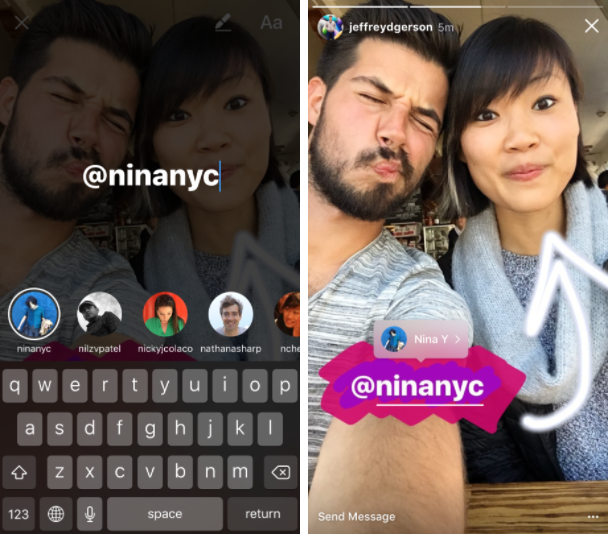 On Instagram, users have the option to post on their feed or their Story. The feed displays an account’s photos and quick videos, and Stories display in a carousel at the top of the screen. The images on your feed are forever, but Stories, like with Snapchat, have a 24-hour shelf life. From the Instagram home screen, a quick swipe to the right gives you access to the Instagram Story camera. From there, you can record video (a regular video or a live video), snap a photo, or shoot a Boomerang to use in your Story. After editing and adding to your creation, you can save your Story to your camera roll, send it directly to another user, or post it to your feed. For step-by-step instructions on how to post a Story, check out our guide to using Instagram Stories for business. Many of the features used to spruce up your Instagram Stories and Snaps are alike. On both platforms, you can add text, stickers, filters, and drawings to add flare to your posts. But there are a few key features that differentiate the two. Mentions are unique to Instagram Stories. Unlike Snapchat, you can “mention” the profile of a friend or follower in your Story. You can also add links (to your brand’s website or a campaign landing page, for example) that viewers can click after tapping the “See More” tab at the bottom of the screen. 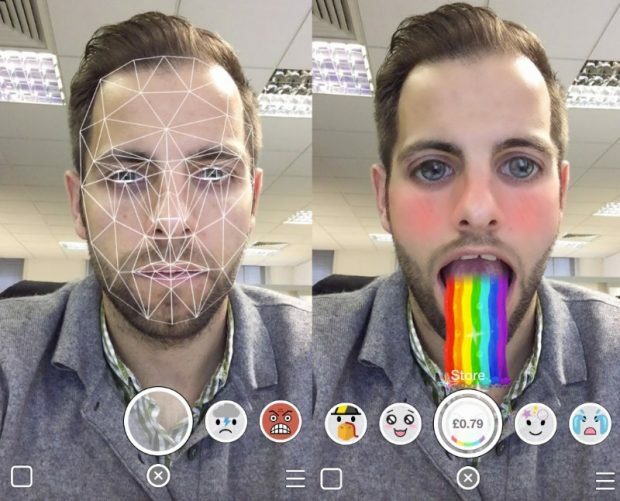 Snapchat also has a ton of customization options when it comes to face-mapping and motion filters—from face swaps to rainbow puke. Image via Computer Graphic Stock Exchange. Both channels offer brands the opportunity to run ads and target specific audiences. So, what’s the real difference when it comes to ads on Snapchat vs Instagram Stories? It’s all in the execution. When it comes to advertising on Instagram Stories, brands can take advantage of immersive, full-screen ads that play between individual Stories. AdAge says ad videos that can run for 15 seconds and sponsored photos for just five seconds. To hone their reach, marketers can use the Power Editor and Ads Manager to target a specific audience and control how often users see their ads. As one of the brands to test the new Story ads, Airbnb ran a series of 15-second video ads in Stories to launch experiences on Airbnb. Their experiment was rewarded with a double-digit increase in ad recall. There are a wide variety of options when it comes to advertising on Snapchat. There’s Snap Ads, which gives viewers more info if they swipe on it (which could be longer videos, an article, etc). 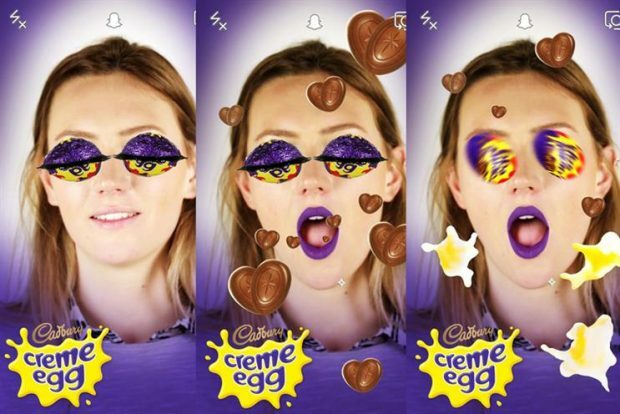 But the bread-and-butter ad offerings that make Snapchat so fun are its Sponsored Lenses and Geofilters. As for the Sponsored Geofilters, these graphic overlays allow brands to target users in a particular region. 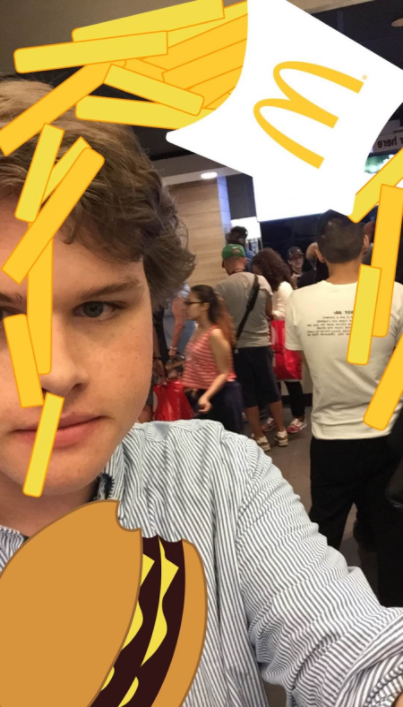 For example, a restaurant or retailer can create a Sponsored Geofilter that triggers when anyone accesses Snapchat in their store (just like this McDonald’s Geofilter). For a more in-depth walkthrough on how to build a flawless ad, peruse our guide to advertising on Snapchat. Which platform works best for your brand? Now that you’ve got the skinny on Snapchat vs. Instagram Stories, it’s time for you to weigh the advantages of both options. You now know who engages most across both channels, you’ve done your homework, and you’ve made your pro/con list… Now it’s time to make your choice. If both platforms work for your brand, then you don’t have to choose—use both. To save a little time and effort, you could try repurposing your content from one platform and sharing it on the other. Whether that means remixing an already-existing infographic into a slideshow video, breaking down an ebook into a list of visualized tips (#MotivationMonday, right? ), or creating a custom GIF to share, follow the best practices we’ve laid out and you’ll be on your way to a robust content calendar in no time.